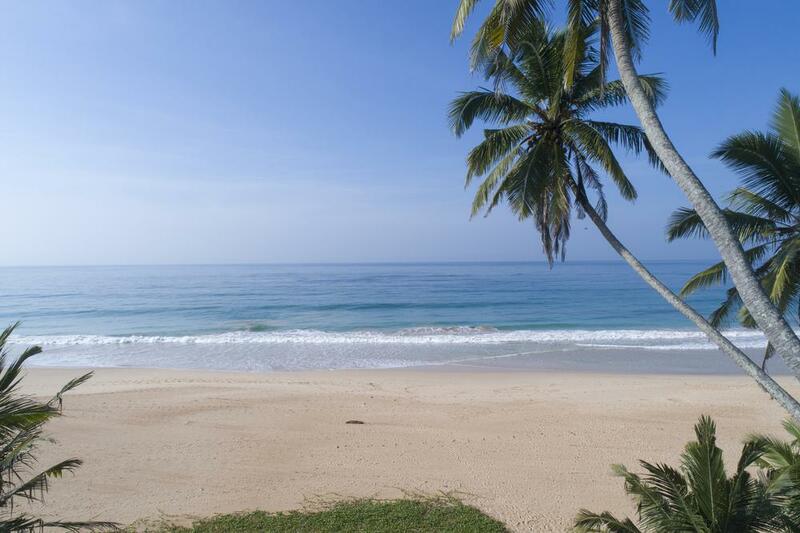 Beachfront 3 bedroom Villa in Habaraduwa, Galle. 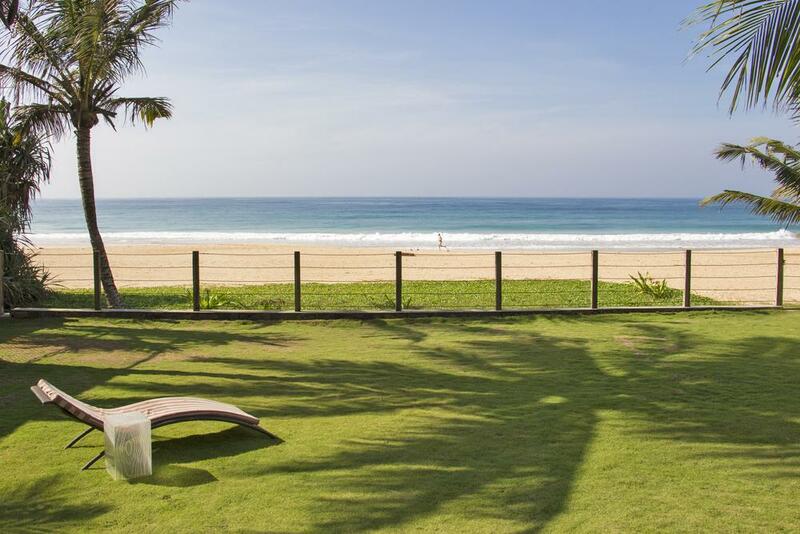 Located in front of one of the best beaches in Galle. 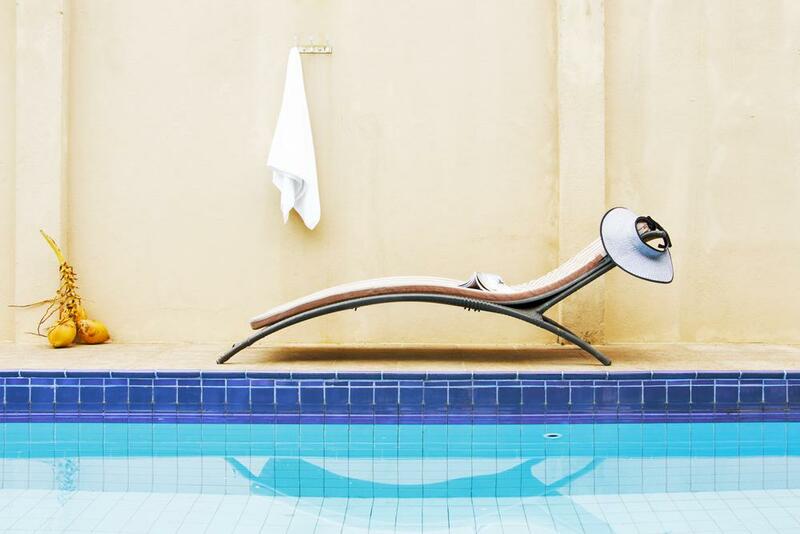 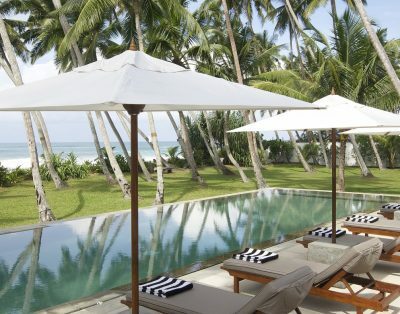 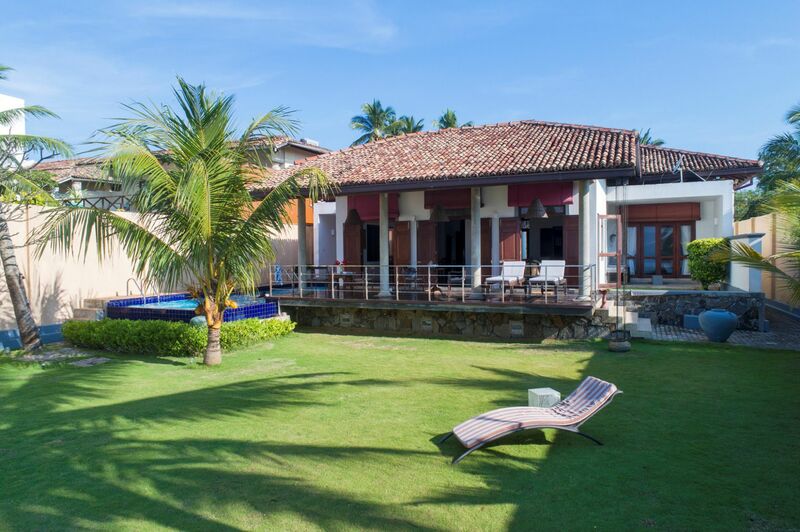 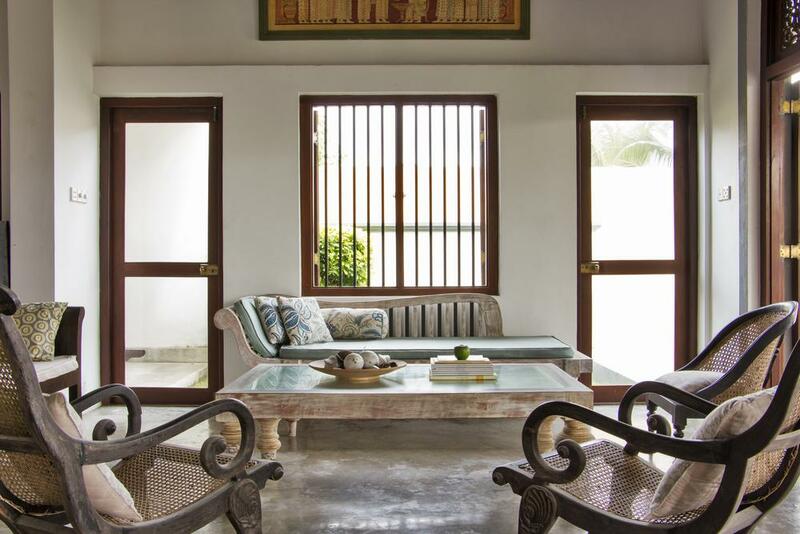 This beautiful property is a 3-bedroom beachfront villa on the Galle coast line, with a swimming pool. 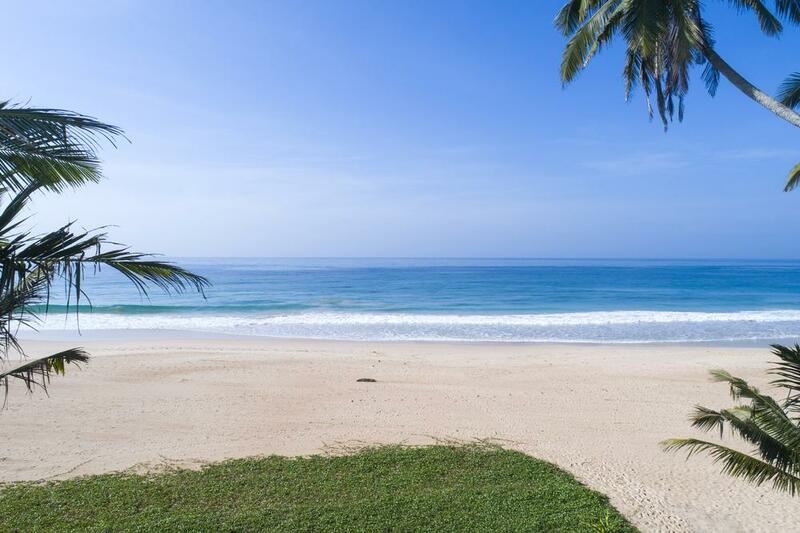 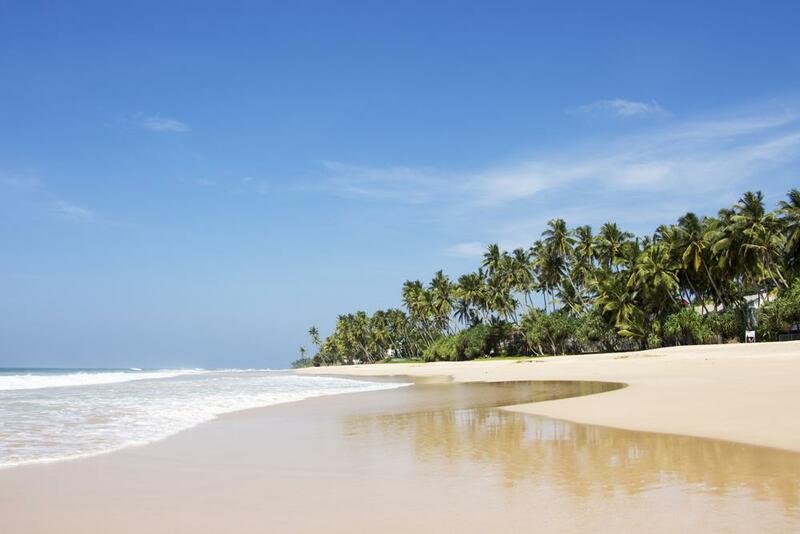 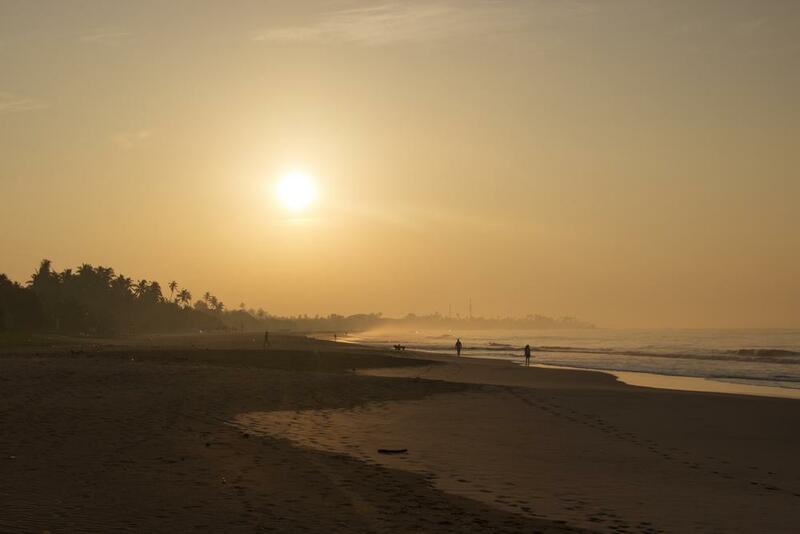 Sleeping up to 6, this property boasts direct access to the beautiful, and often unpopulated, Habaraduwa beach. 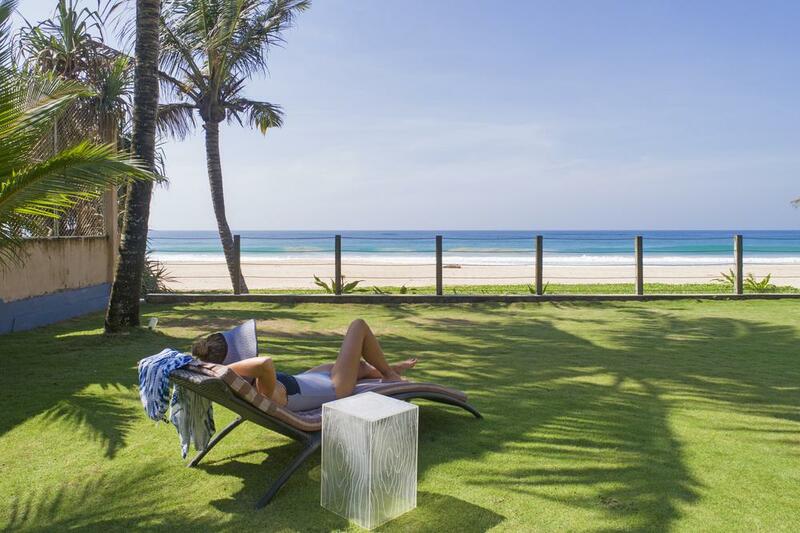 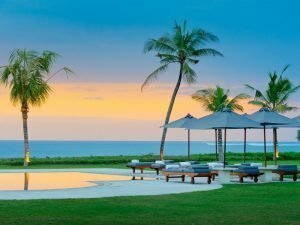 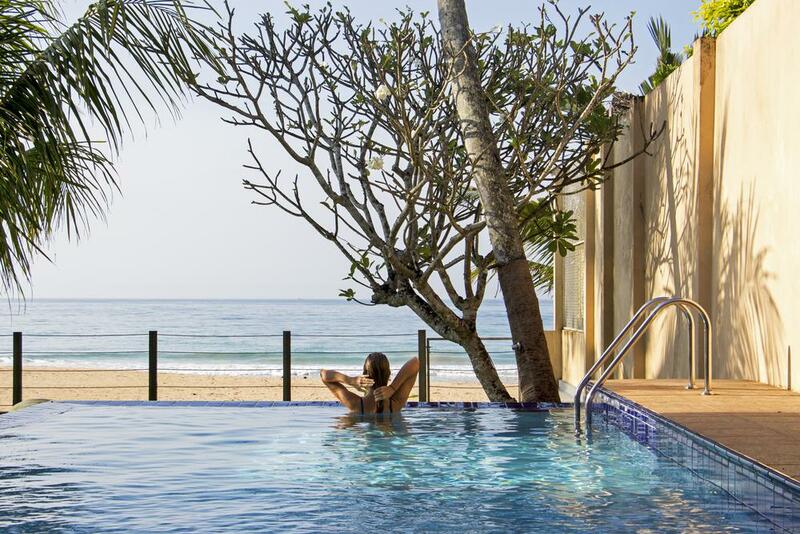 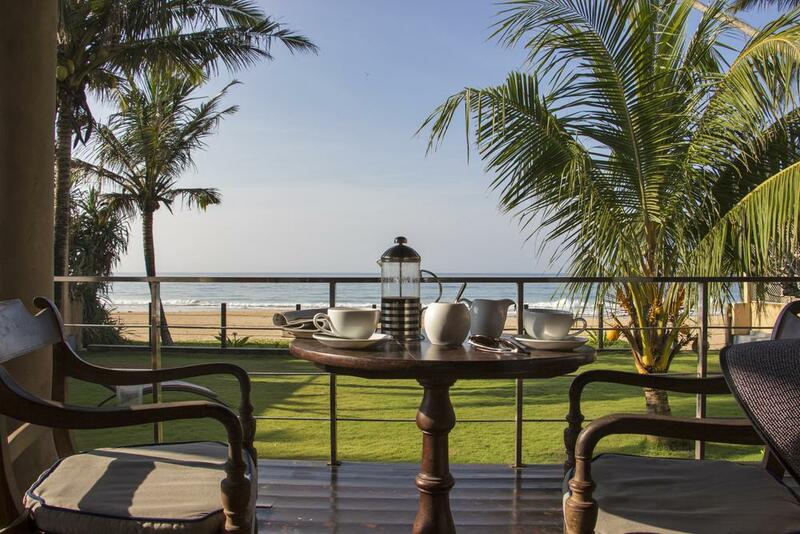 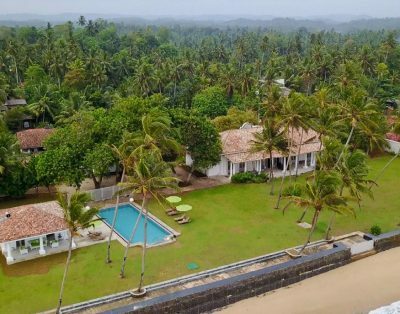 This Villa is situated near to many of the great local restaurants along the coast from Ahangama to Galle as well as popular surf breaks and other fantastic trips and excursions. 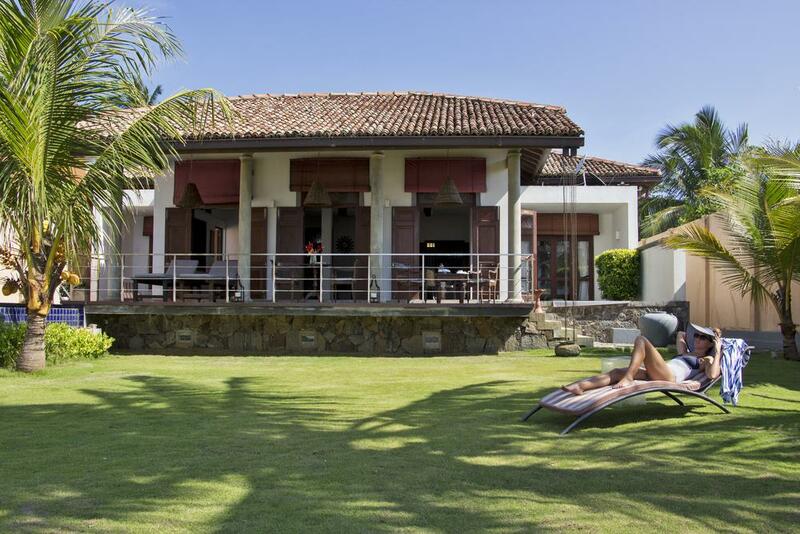 Highly recommend this neat villa, perfect for a family or small group looking for a relaxing beach holiday. 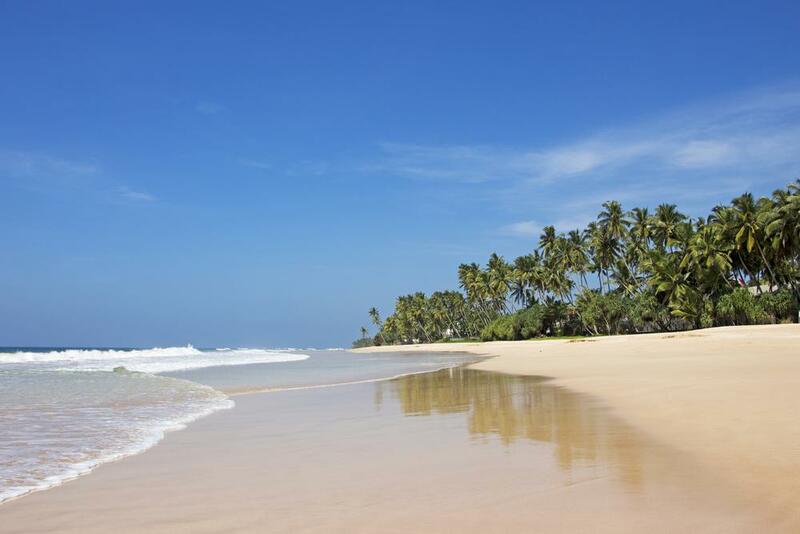 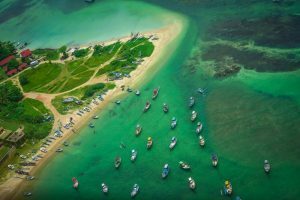 CLOSEST SURFING BEACH: The closest surfing beach is in Unawatuna Beach (10 mins tuk tuk drive) or Wijaya Beach (5 mins). 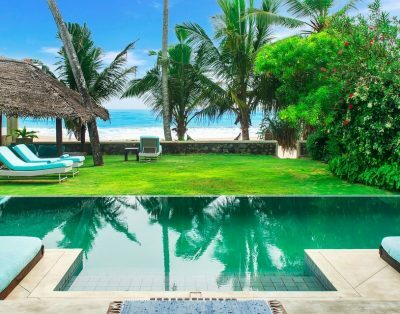 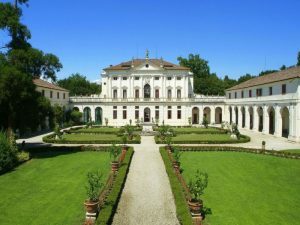 CLOSEST SEASONALLY SAFE SWIMMABLE BEACH: In front of the Villa. 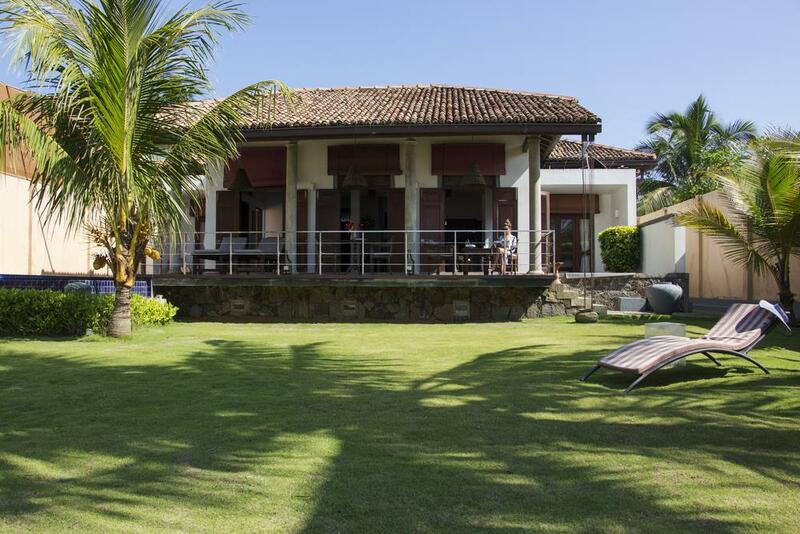 The Villa has three bedrooms with en-suite indoor / outdoor bathrooms. 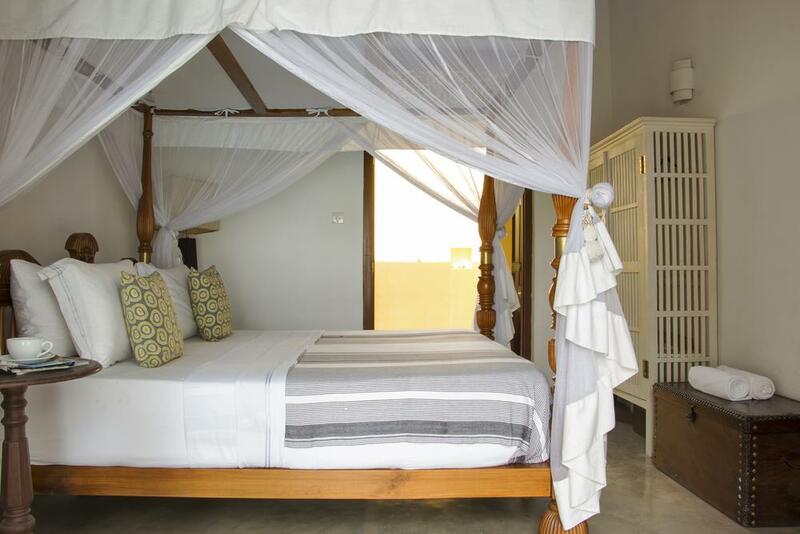 There are two sea facing Master suites with king-size four posted beds and an additional third bedroom with two single four poster beds. 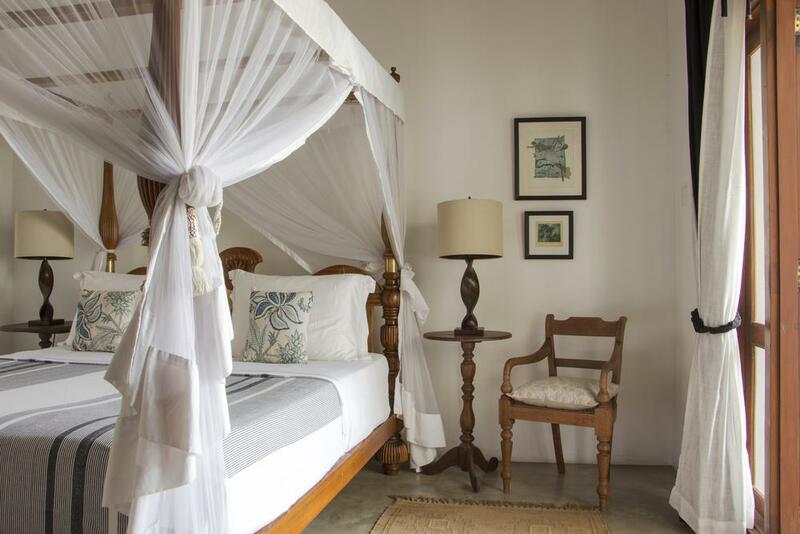 Each bedroom is complete with air conditioning and an overhead fan. 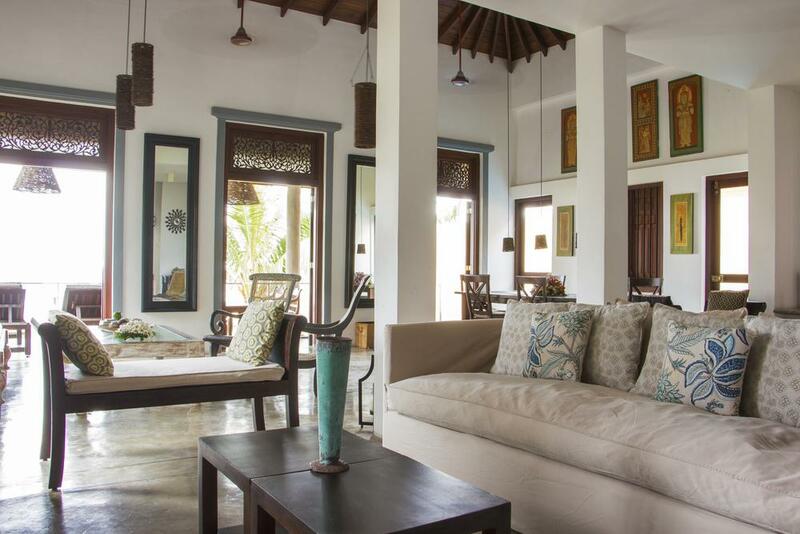 The Master suite on the left has its own garden terrace with sunbeds and phenomenal view of the Indian ocean, whilst the Master suite on the right, has its own terrace, with sunbeds that reach the pool and look out to sea. 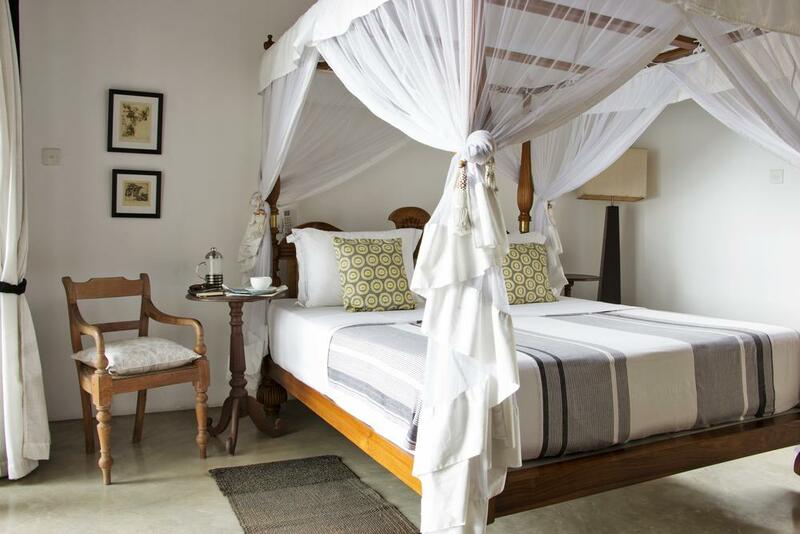 MASTER SUITE: King size four poster bed with mosquito net, AC, ceiling fan, en suite indoor / outdoor bathroom. 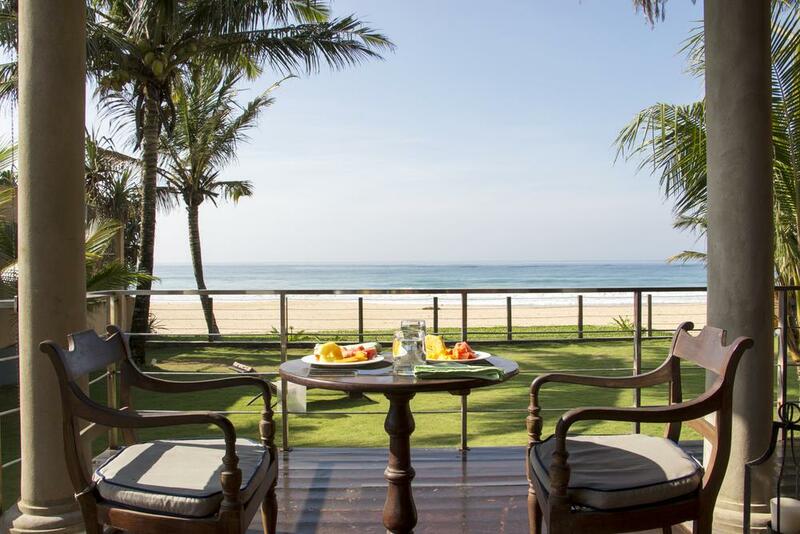 Private terrace with sunbeds and pool and sea view. 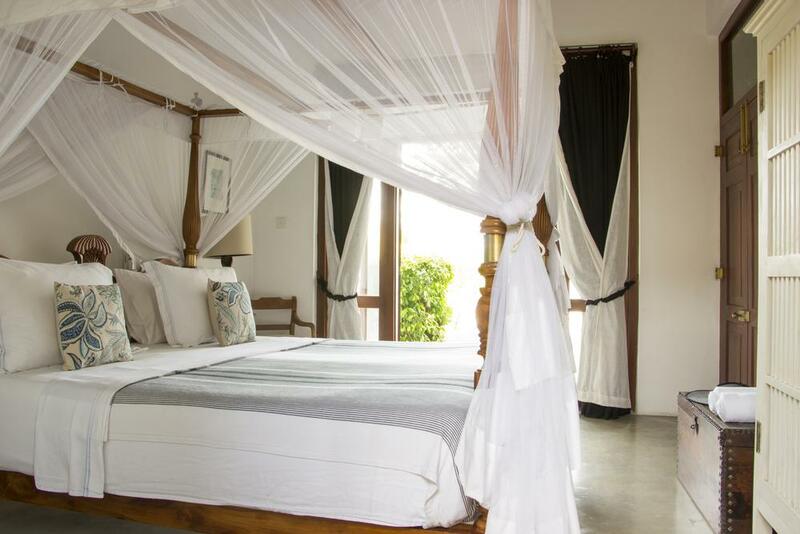 MASTER SUITE 2: King size four poster bed with mosquito net, AC, ceiling fan, en suite indoor / outdoor bathroom. 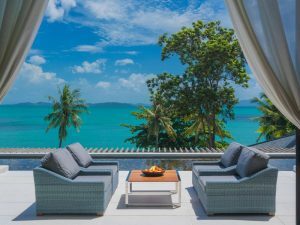 Private terrace with sunbeds and garden and sea view. 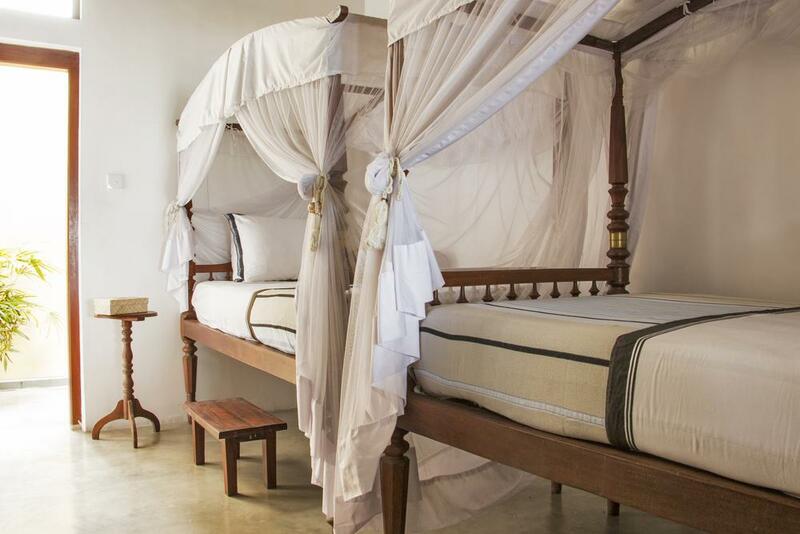 TWIN ROOM: 2 x Single four poster beds with mosquito net, AC, ceiling fan, en suite indoor / outdoor bathroom. 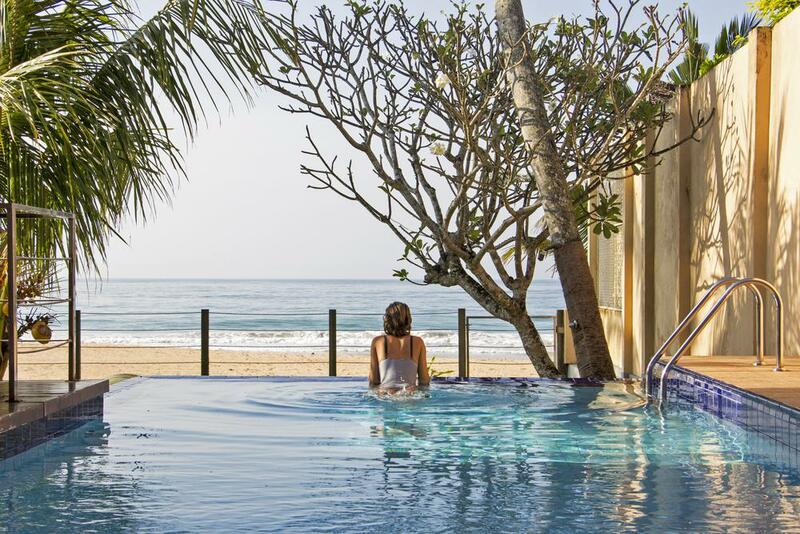 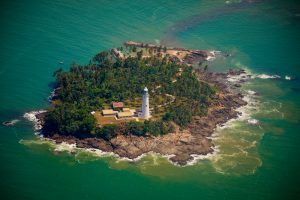 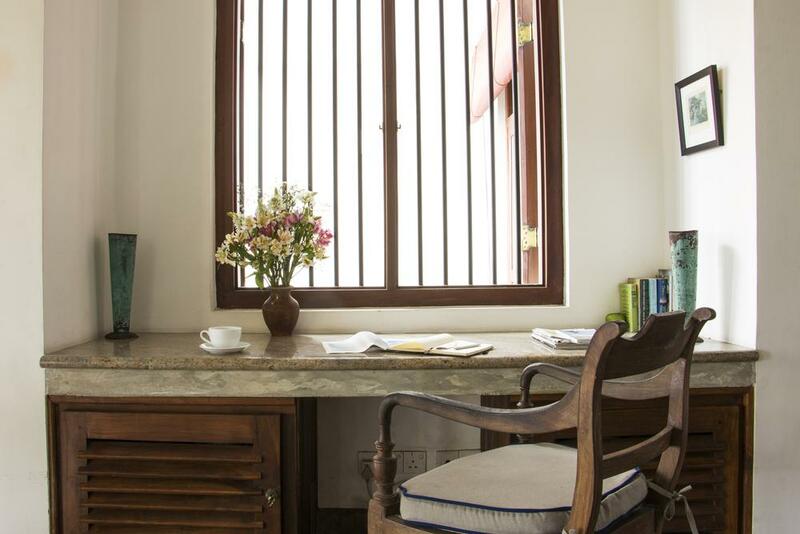 This villa has a housekeeper and an experienced chef, who can cook a wide range of Eastern and Western dishes but excels when cooking traditional Sri Lankan fare. 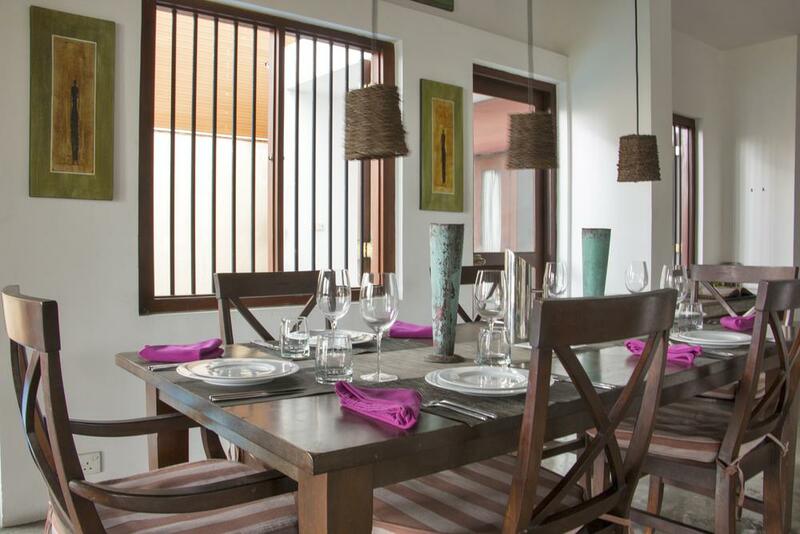 The kitchen is also available for guests to cook for themselves. 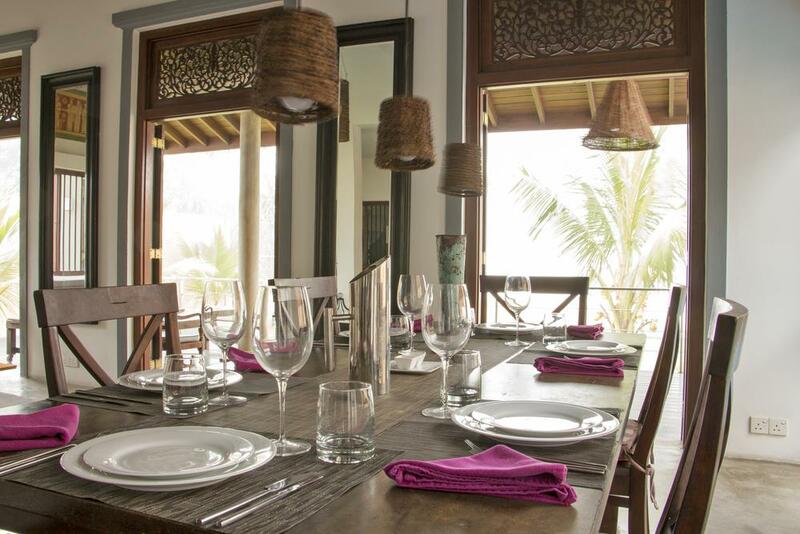 Guests can order fresh fish and seafood straight from the local market or even better from the fishermen who come to the villa to sell their ‘catch of the morning’. 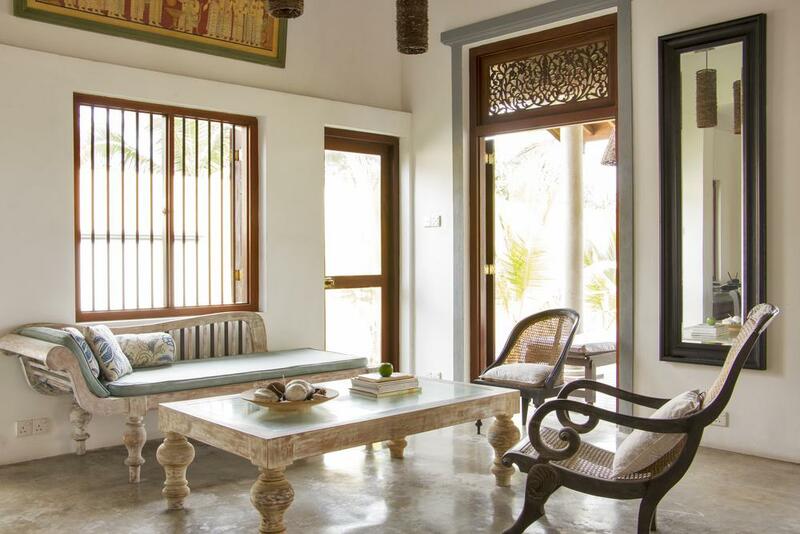 The Villa comes with a chef who is capable of western and local dishes and payment is on an ingredients only basis + transport. 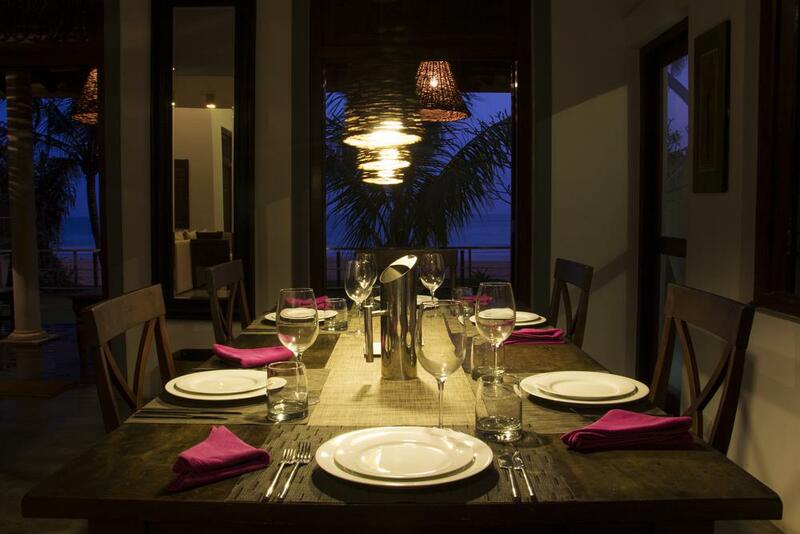 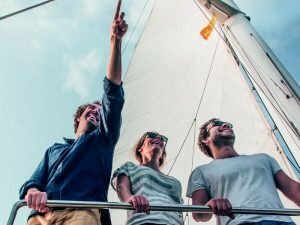 Read more about Villas Meal policies in Sri Lanka. 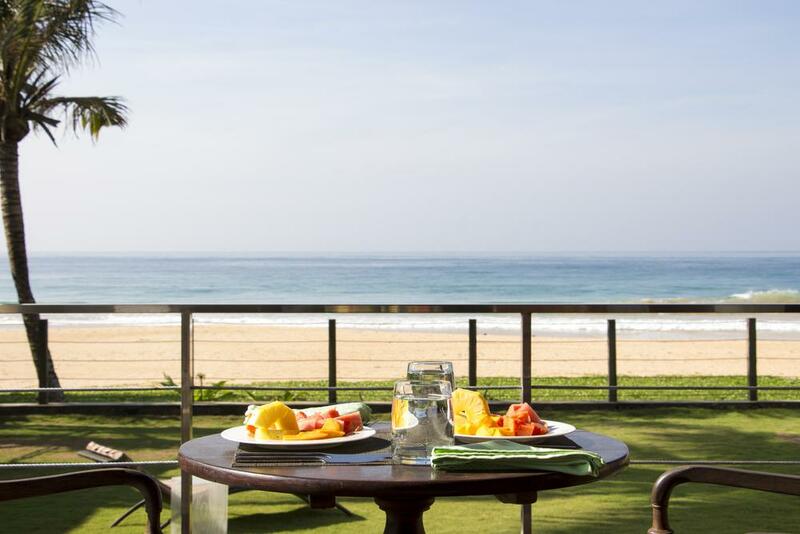 Tropical Breakfast is included in the rate. 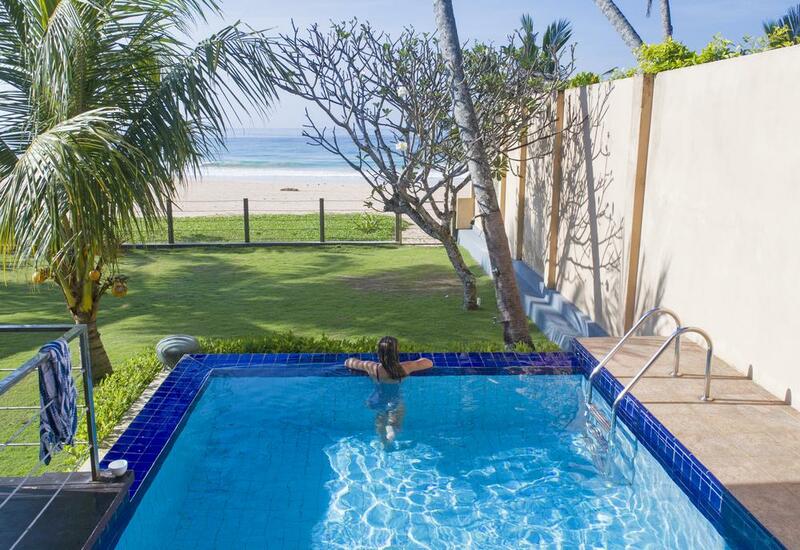 Exclusive use by the room rates available for Off Season.